Constitution Day celebrates the signing of the U.S. Constitution in 1787. This year, the University of North Texas is looking at the constitutionality of a new Texas law, Senate Bill 4 (SB 4,) that goes into effect on September 1, 2017. 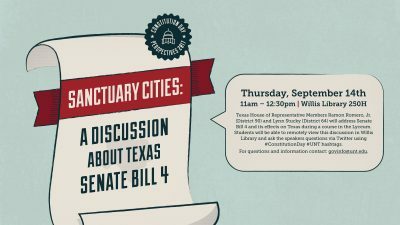 This is a forum style discussion featuring Texas House Representative Ramon Romero, who argued vigorously against SB4, and Texas House Representative Lynn Stucky, who is a strong supporter of the new law. This event will be live-streamed in Willis Library. Students will be able to ask the speakers questions via Twitter using hashtags #UNT #Constitution Day. U.S. Pocket Constitutions will be available at the event or you can visit the Eagle Commons Library in Sycamore Hall to receive a copy. For questions and additional information, please contact govinfo@unt.edu. Posted on behalf of Julie Leuzinger, Political Science Subject Librarian/LLS Department Head. Posted August 31st, 2017 by Lilly & filed under Uncategorised.